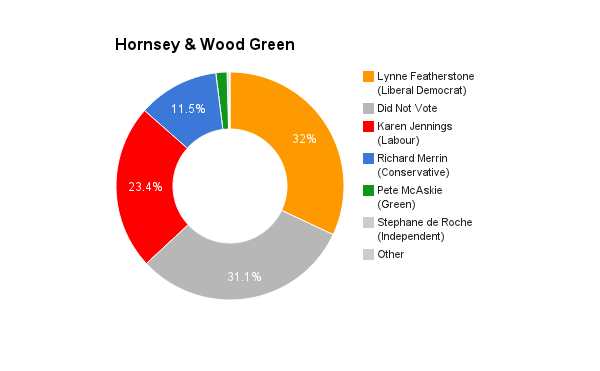 Hornsey & Wood Green is located in Greater London. The seat was created in 1983. The current member of parliament is the Liberal Democrat Lynne Featherstone who has served since 2005. “I have spent a lot of my life trying to integrate my practice and vision for protecting the planet from what unbridled capitalism has been doing to it with interventions in the lives and circumstances of people on the receiving end of power. This took me into social work where during the seventies I was active in Case Con [‘ a revolutionary magazine for social workers’] and Islington struggles for rights of squatters, unemployed people and homeless, and an alliance between communities and trades unions in the fight for social justice. I later helped set up a journal called Critical Social Policy which led in the early critique of Thatcherism. Then I took on being director of social services in Hackney in the 1980s and after fighting back cuts as long as I could — and also innovating new and locally based services — went on to the Kings Fund to consult on health and social care. “For two decades up to 2013 I was working in international development where ecological survival and the struggle for social justice came together in many ways. 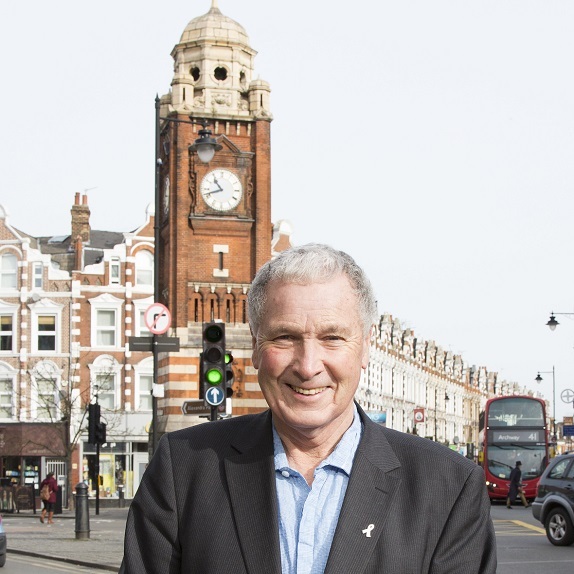 ” Now having come back to Hornsey after some years away, I am keen to end this austerity agenda in Haringey and to reverse the tendency of those in power locally, as well as those in power in Westminster, to see our big green spaces – parks – as cash cows, and people as needing to be run by what I can only call bureaucratic feudalism. Our institutions may be broken and we need a social movement of people to show alternatives. I feel part of that movement which is why I am enthused by what is happening in Greece with Syriza, in Spain with Podemos, and indeed in Scotland following the Referendum, and if I get to Westminster then a few Green MPs really could be in a position to change the political agenda”. I would have regular Saturday ‘surgeries’ or call-in sessions every two weeks in the constituency and these would be arranged in a circuit between Wood Green, Stroud Green and Crouch End, and Muswell Hill locations. I would be open to public engagements at other weekend times. I would have Q and A on-line for constituents through social media accounts [open to other as well as Twitter and Facebook] and dedicated part of Haringey Green Party website. I would produce monthly reports of my activity. I would survey constituents on key national issues, and host events for often excluded groups. I believe strongly that unfair and unequal power must be challenged, and my life long values and experience in working for the public good and pursuit of social justice have always operated without fear or favour. I have been a teacher and researcher, social worker, director of social services, international consultant on health and social development, and local campaigner defending NHS and public services against cuts, and if elected I shall seek to change this austerity agenda of the three main parties in favour of public investment and decent local jobs. I think the current MP, Lynn Featherstone, has achieved something with her work to end gender and discrimination on sexual orientation, and in combatting FGM. As someone with much international development experience I commend her work as a minister with DFID. I do however differ on her role in maintaining the priorities of the Coalition government which has presided over significant worsening of inequality and cuts in welfare for the most vulnerable. Austerity is not working, and there are many voices from Nobel prize winning economists to the IFS, as well as all those on zero hour contracts and NHS workers with frozen pay who will say so. It is an ideologically driven policy to privatise assets of the state, transfer wealth from those on median to low incomes to those running the financial sector and controlling national indebtedness, and reduce the value of commonly held services. It has not worked on its own terms, as all history shows that national debts have to amortised – re-defined and re-negotiated – for the society to benefit. Legal migration is a vital human freedom. The NHS and many fundamental services as well as renewal of skills and talent in the UK have been dependent on people coming into the country. That will not change. And we do owe much to war and climate refugees too. We do need a balanced migration policy so that open borders are not an option, but at the same time we need to address low incomes and life choices in the UK through a Living Wage rather than maintain a system which depends on social care jobs often not even earning the current minimum wage and require migrants to fill them. I think the cost of living is now a major issue for the majority. Investment in public infrastructure and Green New Deal jobs will create earning and tax paying capacity which dependence on zero hours and off and on spot contracts for self employed [but often workless] fails to do. A Living Wage – at least £10 per hour by 2020 [and higher in London] – along with rent controls on landlords and security of tenure, plus an end to unrestricted property and land speculation in London especially, is necessary. And local/municipal energy production to end the cartel-like behaviour of big energy companies. I would abolish the NHS and Social Care Act, and the purchaser-provider split in the NHS – brought in by Labour, and accelerated by the Coalition government – and fully re-instate the NHS, without privatisation.Primary and community health care would need to be much more adequately funded [from Wealth Tax, and cancellation of Trident] and social care made universally free. Social care employment and the interactions from it contribute to the economy, not drain it. Integration, prevention and wellbeing would be funded properly, not fragmented for competition. Apprenticeships need to be much more widely available and have guaranteed job entry to follow. The cuts in further education need to be completely reversed so that life skills, digital universe training, vocational skills and re-training for work are seen as basic rights, and not as at present part of the punitive DWP regime. Education Maintenance Allowance should be restored. A system of incentives to small and medium enterprises, including business rates exemption periods, and good employer branding for contract applications established. And local authority-wide clean and local energy and retrofitting to combat fuel waste and fuel poverty infrastructure and job creation set up, with training for workless people. I think the representation current in Parliament is very skewed towards professional politicians, and is still far too gender-biassed. The Green Party believes in gender equality and promoting a more diverse representation through positive action to include people who are under-represented, whether women, BME people, LGBT people or groups without a voice. I support the right to recall an MP, and accountability annually. I am an elder who wants to bridge the divide between young and old, artificially created by politics becoming a money-making career. In an EU Referendum I would argue strongly for YES to Europe vote. I believe that we are very much part of Europe at the same time that I think the EU Commission and the structure of EU has become too ‘corporatist’ and distant from ordinary people, and subject to unequal lobbying pressures. I would press for staying in, and for reform. I think that the work of Green MEP for London, Jean Lambert, has been exemplary in attempting to limit corporate power, and warning of the dangers inherent in the new deal being negotiated in secret between the US and EU – TTIP – giving corporations power over states.